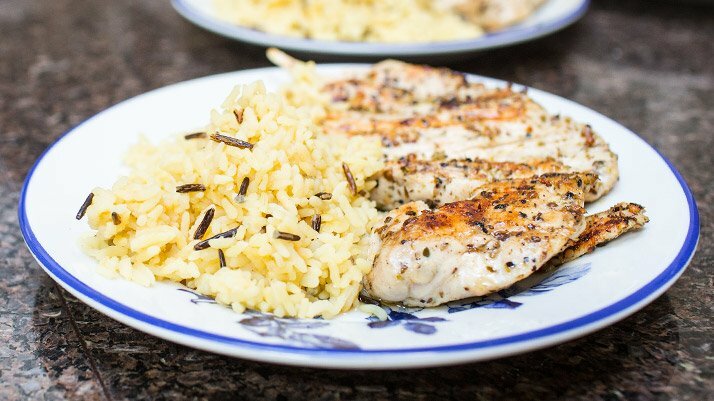 Chicken breast and brown rice is a bodybuilding staple—and for good reason! Here's the tastiest way to make it. Everybody needs an easy chicken recipe for when you just don't know what to make. When I'm out of ideas, I always turn here. Mix chicken, 2 tablespoons olive oil, Montreal spice, chili flakes, pepper, and oregano in a Ziploc bag. Place bag in fridge and allow to marinate overnight. Heat 2 tablespoons olive oil a nonstick skillet. Add chicken breast to the pan and cook for 4-5 min on each side, or until done. Follow directions on rice package and enjoy with chicken.